July 31st, 2009 , under ActionScript, Games. Click on groups of the same color. The bigger group, the more score. You get a message when no moves can be done, or when the board is empty. I’ve learned you need to think twice before starting coding. This game had some really challenges in it. Conclusion: Modulo makes live easy. We need to use it more. How to find all blocks around the active block? It loops around the active block to see if they had the same type (=color). If not; stop looping. If it does; repeat function from that point again with exception below the imaginary boundaries created in challenge 1. Well, this is a typical example to use recursive loops; I used it for this. Recursive programming is a bit hard to understand if you don’t work a lot with them. My conclusion: Learning recursive function is cool. When you clear a column, the column should move to the left, right? I thought that would be very easy; just move all columns after the newest empty column just one position to the left and that’s it. But it wasn’t that easy. I needed to loop through all the columns after the empty one, and push it them the left. But.. At the right side of the board there are empty columns too (if you clicked a empty row before). So Flash was thinking; Cool I’ve found some empty rows at the right side of the board. Yeah; put more to the left. 🙂 But there wasn’t more, because the column before the last empty column at the right side is the last one (you still get me?). Flash was recursively looping and after 15 seconds he gave up.. an infinite never ending loop. Conclusion; I needed to calculate the last not-empty-column first. Then find the empty columns between the first empty column in the middle of the board and the calculated not-empty-column. If found it; move that columns one position to the left. I hope you like the game. 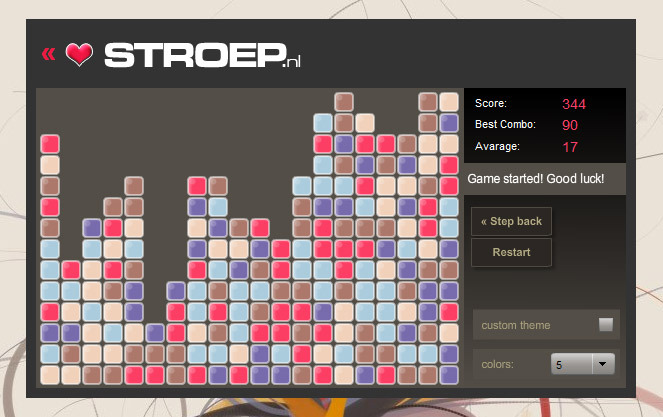 I haven’t implemented a highscore (yet). Code will be available soon on flashden. This type of game is generally refered to as ‘SameGame’. Nice game you have, but question. How about translating? Can i easily translate it to every language i want?